A new column up at Indian Country Today points out it IS the NIGC's trust responsibility to AMERICAN INDIANS, including those that face disenrollment to protect their rights. Over ONE BILLION DOLLARS have been stolen in per capita and benefits have been stolen by tribes, under the guise of "correcting enrollment rolls" which is code for STRIPPING the CITIZENSHIP of Native Americans. The NIGC’s deference to an intra-tribal system of check and balance in that context, is derelict. So is the Commission when it comes to the trust responsibility it owes to every single enrolled member of gaming tribes. By the admission of former NIGC Chairman Harold Monteau, the NIGC owes a “direct trust (fiduciary) responsibility to American Indians”—meaning not merely to tribal governments, but to tribal members, including those who face disenrollment. Chairman Monteau, too, was not afraid to enforce IGRA—even shutter casinos—when gaming monies became weaponry in internecine tribal conflicts. 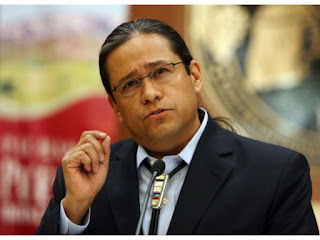 Both Chairmen Hogen and Monteau understood that by taking enforcement action against one tribe, the next tribe was deterred from violating IGRA, which in turn deterred Congress from meddling with Indian gaming. Each took the long view. Deterrence is crucial, and required by IGRA. 25 U.S.C. § 2702. There is a deep hole in the IGRA provisions for dispute resolution. Federal regulations require tribes that distribute per-capita to implement a dispute resolution mechanism where tribal members can submit complaints and appeals for resolution in a tribal forum. This way when tribal members have problems they can get them resolved without resorting to an outside sovereign. Tribal leaders know that the way around this is to disenroll members, and deprive them of tribal benefits. The BIA policy is non-intervention, but also the BIA policy is to let tribes determine whether or not an Indian is eligible for benefits. The BIA denies Indians benefits unless they are enrolled in a federally recognized tribe, yet the BIA does not determine eligibility. It is a true dereliction of duty, but wait, it gets even worse. Only enrolled tribal members have standing to pursue appeals of per-capita distribution disputes. So the tribe can take away your benefits, the BIA won't intervene, and the recourse to appeal is denied. The first disenrollee who challenges this wrong will doing all disenrollees a huge favor. I suggest that disenrollees who have been denied per-capita payments appeal to the BIA under 25 C.F.R. 290.12 (5). This is the federal regulation that governs the dispute resolution for per-capita benefits. Tribes are intentionally disenrolling members to prevent them from filing appeals of loss of benefits. The BIA will probably rule that non-members lack standing to appeal denial of per capita. The appeal must be escalated to the IBIA (Interior Board of Indian Appeals), where the BIA judge will affirm the BIA's ruling. Then the appeal must escalated to the AS-IA, and the AS-IA will affirm the IBIA ruling. Then the appellant can go to court and sue under the APA. I didn't say it would be easy. It is purposefully designed this way. Also the Court will give the BIA deference and and will give them wide leeway in their decision making. However, it was the intent of the federal regulation to give tribal members an avenue of appeal and the BIA cannot allow tribes that have approved Revenue Allocation Plans prevent members from filing appeals by disenrolling them. The BIA will then file a motion to have the case dismissed because the gaming tribe is a necessary party. Tribal sovereignty is limited by acceptance of the provision of the IGRA. Gaming tribes have to comply and can be held accountable, so this motion can be defeated. After a couple of years they hope you will give up, but if you have the resources and the determination you can win a case like this. Especially if you get other disenrollees to join you as a plaintiff. Then you can bring a joint or class action litigation and that will make your case stronger. The NIGC does nothing about rampant employee theft and embezzlement at PRC so I can see how they also ignore theft of per capita via disenrollment. Nobody is watching those that are commissioned to watch. Marc I want to remind you time is almost up. You have had time to do the right thing and repent the day is coming when you soul will be required of you, as it is for all of use. rich or poor it makes no difference the day of judgment is coming. National Indian Gaming Commission is a farce and only serves as a figure head. Senator John McCain is correct to question the integrity and validity of this commission. How did Macarro push through all those new water parks and features at Pechanga?...California is under an extreme drought and no one in Temecula can water their yards or waste water....yet the whole new addition is full of water features. Where is that water coming from? Because they are "sovereign" and there for can do what ever they dam well please, with no repercussions. Sovereignty is understood in jurisprudence as the full right and power of a governing body to govern itself without any interference from outside sources or bodies. Therefor they can use what ever water they dam well please. Is Mark showing the size of his man hood in this photo. Another Chief Little Pee Pee. Maybe Holly would like a real big warrior. @4:07pm...then why do they say they can't give free drinks at the casino because California won't let them and why do they tax the wins? If they are truly sovereign and don't have to follow rules, their actions make no sense.